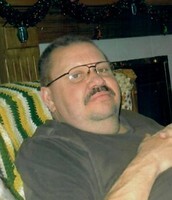 Provide comfort for the family of Ronald Ficht with a meaningful gesture of sympathy. Peacefully at the Stratford General Hospital on Sunday, March 31, 2019. Ron Ficht, of Woodstock, in his 58th year. Beloved son of Phil & Jean Ficht. Loving brother of Louanne & Grant Schultz. Dear uncle of Josh, Rachel & Mike, Mia and Molly Regan. Ron will be sadly missed by his family and friends. Special thanks to Dot & Art Arnold and Jeanie Bergman for their visits and support of Ron. Our deepest condolences on the loss of your son, Ron. I will miss his friendly waves and cheerful hellos coming from your front seating area while he visited you. So very very sad news. I remember fond memories from EOCS and Boys Club. I had just connected with Ron late last year on Facebook but did not know how to work the privacies to be able to catch up. My heartfelt condolences and prayers to the entire family. Ron always had a great sense of humour, will be sadly missed. My condolences to the entire family and friends. I will miss speaking with you at the Symons functions. It will not be the same now. RiP you free of pain now.